In many ways, aquarium husbandry may be thought of as an artistic expression of the hobbyist in which living organisms are the figurative colors on a painter’s canvas. Images of vividly-colored marine fishes and invertebrates co-existing in reef ecosystems are the inspiration of many marine aquarium hobbyists, and the acquisition (and maintenance) of healthy, colorful corals and clams is a primary aspect of achieving the desired appearance of a captive reef habitat. Much of the observed coloration of corals, clams, and their allies, is attributable to biological pigments created by symbiotic zooxanthellae residing within their tissues. These pigments are termed “Biochromes”, and their formation and perceived appearance are at least partially influenced by the presence of trace elements that form the basis of more complex molecules. Certain characteristics of the light source(s) used to illuminate the aquarium will also influence the observed coloration of an organism, however the actual coloration of the organisms will still be primarily dictated by the pigments present, their ratios to one another in the same tissue, and other physical, chemical, and biological factors. 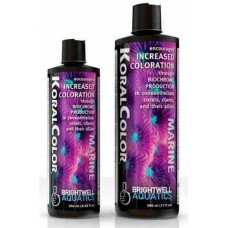 KoralColor provides elements that are known to be incorporated into a number of biochromes. 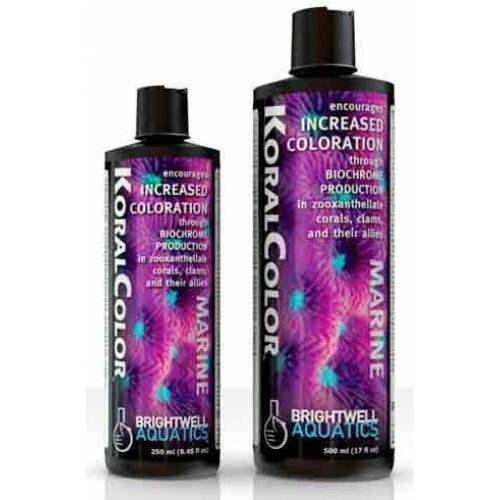 Used as directed, KoralColor will provide elements that may be utilized by captive marine organisms to enhance their coloration. It is not intended for use as a general supplement for maintaining natural seawater concentrations of elements for the purpose of satisfying enzymatic and neurological requirements of aquarium inhabitants; for this, use Brightwell Aquatics Replenish. Although the tendency of many hobbyists may be to dose heavily in hopes of obtaining “brighter invertebrates faster”, this product must be used as directed below for maximum positive results. Do not overdose, as doing so may be detrimental to the long-term health of the aquarium inhabitants. Dose according to the following guidelines, and base the specific dosage required for an aquarium on the total volume in the entire system (including sump(s), water displacement by rock and bottom substrate, etc.). The general purpose of providing the elements incorporated into biochromes is not necessarily color change, but color intensification. Because every aquarium presents different chemical and biological conditions, the dosages provided above are intended as general guidelines, to which the hobbyist should alter as the requirements and appearance of the aquarium inhabitants dictate. We encourage hobbyists to use this product responsibly and only as directed. Basic: Add 1 ml (~20 drops) per 25 US-gallons (94.6 L) every three days (alternatively, twice a week). If using the product in a particularly small aquarium (e.g. ≤ 10 US-gallons), dilute 1 ml of KoralColor in 8 fl. oz. of purified water and add 1 fl. oz. of the resultant solution per 3 US-gallons twice each week (i.e. Wednesday and Saturday).